Why do artists need basic sales skills? Isn’t that the job of the gallery? We know by now that the art sales landscape is shifting significantly. Traditional galleries are increasingly giving way to online stores and less conventional ways of selling art like artist cooperatives. Even if you are represented by a gallery now, that could change in the future. And if you have no idea how to sell your own work, you could be left in a critical lurch. Basic sales skills come down to representing yourself and your brand with confidence and competence. The cornerstones of sales are confident body language and understanding how to ingratiate yourself to your customer with honesty and storytelling. On the flipside of this, and just as important, is the skill of active listening. Sure, you’re the star of your art show. But you still have to communicate to your customers that you care about them and hear what they’re saying, otherwise you may come across as arrogant rather than simply confident. 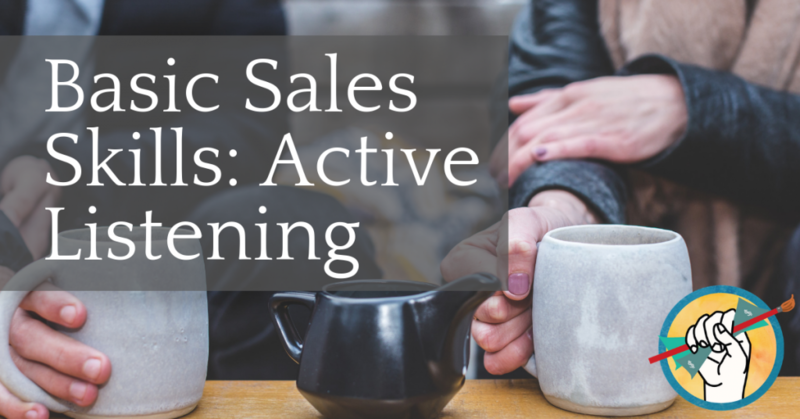 Active listening helps to ingratiate you with your customer, to let them know that you’re trustworthy and compassionate, and it makes them more willing to enter into a relationship with you and become repeat clients in the future. Sensitivity to the speaker’s feelings and to the subtext of the conversation and body language. Processing what’s being said and restating or rephrasing it back to the speaker periodically. Responding with verbal/physical acknowledgements of listening and understanding, and asking questions when useful. What happens if you aren’t actively listening? If you aren’t actively listening, you won’t remember what your customer said, which means you can miss out on valuable opportunities to communicate to them in an authentic way why they should buy your art. Not only that, but your face and body language is sure to betray your disinterest, losing the sale..
A huge part of active listening is understanding body language and facial expression. Make paying attention to the body language and expressions of others a daily practice: while you wait in line at the grocery store, when picking up your kids from school, sitting in the corner of a coffee shop, etc. You can take it to the next level by keeping notes. Do a little eavesdropping on conversations for context, and make notes of the body language you see and how it corresponds to the emotions being displayed. It might feel a little weird to sit and watch people and write down what their eyebrows do when they are uncomfortable. But it’s just a way to train your mind to start paying attention. This is a helpful practice for artists of all disciplines! Processing is really just about making sure you understand what’s being said. Our brains process everything automatically, but whether you really understand comes down to how hard you’re paying attention. This is where restating and re-phrasing is extremely useful, not just for your own understanding, but to show the speaker that you are listening. You can start practicing this with your very next conversation. When the speaker finishes a thought, say something like “so what you’re saying is xyz,” or “let me make sure I understand: you think such-and-such.” Restating what they’ve said is a great way to invite them to correct any errors in your understanding, and communicate that not only are you listening to them actively, but also that you care about what they’re saying. This is where you really want to think about your own body language. How are you communicating your interest with your hands, your arms, your eyes? Are your arms crossed defensively in front of you, or are they a little more open? Are you looking around the room, or are you making eye contact with the speaker? Are you nodding on occasion and giving little verbal encouragements that you’re listening (mmhmm, right, go on?) Or are your eyes glazed over with boredom? If you can get over the silliness of it, you can practice in a mirror. Or better yet, before your next art show recruit a friend and ask them to give you feedback on the way you react physically and verbally when they talk to you. How can artists in particular be successful with active listening? Artists are often very emotional and empathetic by nature. You see little details about the world that others miss, and this can be a tremendous advantage for you when it comes to developing a trusting rapport with your customers. You can use your knowledge of the importance of active listening as a chance to study others and use that as research to improve your business and your work. To learn more about reading body language and communicating confidence, be sure to check out Vanessa Van Edwards’ Science of People. Want to learn more sales skills? Start with your unique value proposition. 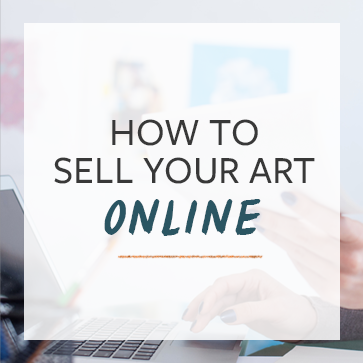 You’ll also want to check out 10 strategies to improve your art sales, and make sure that your website is up to snuff too with a killer sales page. Did you hear that Vango has shut down? It shows that we still need to be adamant about learning business skills as individual artists. I haven’t had the chance to use it myself because I was afraid of packing/shipping my art for the longest time. Hopefully we get some other apps like it soon.